There is something about the foods grown in Northern Michigan that causes the "wow" reaction when they are eaten. The combination of the climate, soils, and work of the local farmers create something really special. And these special foods can be found in our many Farmers Markets. From tart cherries to peaches to sweet corn to potatoes to apples, Northern Michigan grows the best. Our Farmers Markets are open from late spring to fall and are a cornucopia of culinary delights. 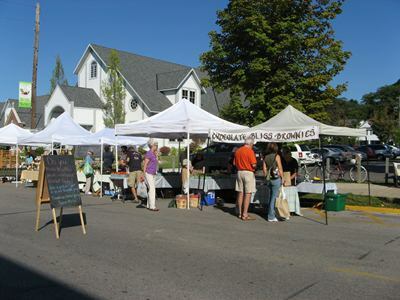 The "local foods" movement is nationwide and local in Northern Michigan means the best. From Boyne City to Charlevoix to Petoskey to Harbor Springs to Indian River, local residents and visitors get the wow factor over and over again as the season progresses. The growing season and the spectacular soil in Northern Michigan makes "local" something special. Buy a bushel of tomatoes and can them for winter to follow. Pick a peck of apples and make apple pies and apple butter. Go home with a basket of cucumbers and make pickles that will be a great gift for the holidays. A bag full of herbs can be dried or made into vinegars. Northern Michigan has spectacular local foods that can make a wonderful summer meal or be turned into a great "memory" when it is preserved. 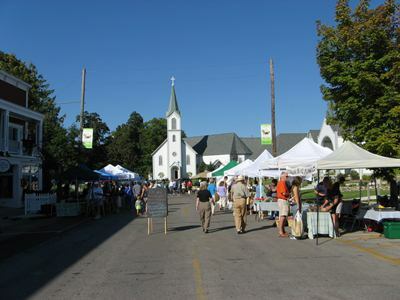 In addition to fabulous outdoor markets in the warm weather months, Boyne City, Charlevoix, Harbor Springs and Petoskey all have indoor markets in the winter months. Year 'round local foods from local farmers!